"The Void is a terrible thing, but it can be stopped." Rydia Mistcaller was a Lynae during the Kiltian Era, of the Third Epoch. She is believed to have been the first caller. In addition, what information exists about her indicates that she was able to bond with Primals that are not acknowledged in the present. Rydia was not yet born when Lexicon slew the True Gods, but was born shortly thereafter. In the chaos of the world that ensued, a great many individuals broke off from the three great powers of the era and began researching areas of knowledge that were, at the time, foreign to the denizens of Trinity; amongst these were Asyas the Possessed, who had once been a priest, but had given himself wholly to the Void and became a conscious Nihimental, one of the very few known throughout history. Trained originally as a shaman in the Kiltian city of Kegate, the City of Bells, Rydia showed great talent, with an intuitive grasp of the elements. When rumors began spreading that individuals who ventured too near the Citadel of Asyas were disappearing, it was Rydia to whom the leaders of Kegate turned, who asked for her assistance in dealing with the threat. 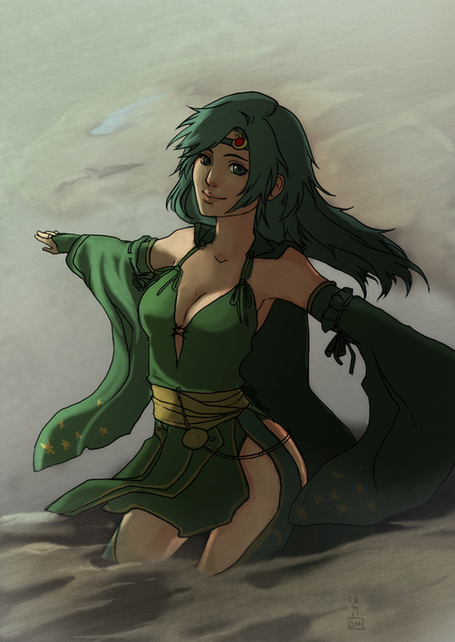 Uncertain of her abilities to do so, however, Rydia sought out new knowledge of the elements, and found ancient Yuan-agan texts relating tales of the Primals; her quest took her to the Citadel of Baeli, where she met with Yuan-agan sages who could only give her hints and fragments of the knowledge she required - however, they indicated that to even attempt to contact a Primal, a key would be needed, as well as a place whose elemental energy was pure. Rydia traveled the world for a time, seeking out an appropriate substance from which to construct this new totem, as well as find a place of pure elemental energy. Venturing to the isles east of Asyas' citadel, she encountered a rock fragment of a kind she had never seen and was unable to identify. Carving it into the shape of a falcon, having been born under that sign, she ventured onto the highest point of the islands, and found an intense concentration of elemental wind. After a long meditation, she found herself able to quell the other elements present in the area, until only wind remained - it was then that the Primal Garuda appeared. While the original history holds that she defeated this entity on her own, the altered timeline due to the events of the Epoch Trigger are such that a group of adventurers from the future assisted her, though in doing so their presence caused the manifestation of Garuda to be significantly more powerful. Once defeated, the essence of Garuda became bound to the stone falcon, to which Rydia had attuned as her totem. Now armed with the ability to call upon a Primal, Rydia ventured further out into the world, seeking places of similar nature, and over the course of many years, bound her soul to the essences of all the known Primals. It is also rumored, though with little substantial evidence, that at some point Rydia was contacted by a Primal of unknown origin and power; in few conversations accessible in which she mentions this entity, she refers to him as an avatar of Gaia herself: in essence, the Primal of the prime material plane. The power of such an entity is unknown, and indeed, no caller since Rydia has come to know of or be contacted by any such entity. Having attained what she felt were the necessary allies to do battle with Asyas, she ventured to his Citadel, and through the combined might of the Primals upon which she was able to call, defeated the priest-turned-voidchild. After his defeat, however, she learned that he had acquired many disciples, who had scattered throughout the world to spread their mischief and message of nihilism. Rydia would then spend the remainder of her life hunting down these individuals and attempting to stop the spread of the teachings of the Void. Rydia is a caller, and as such, is able to call upon the powers of various Primals, vastly powerful entities that are, essentially, physical manifestations of the elements themselves. Rydia is also believed to be able to call upon a Primal that is essentially the avatar of Gaia herself. What abilities this entity has granted to Rydia are unknown, and indeed its capabilities are presently beyond mortal understanding. As an individual who was devoted to stopping the Void, it is probable that Rydia has specifically cultivated abilities that would allow her to cancel out or negate the abilities of Nihilists. It is also known that, as a believer in Gaia, Rydia's soul was reincarnated, and has been undoubtedly been reincarnated many times since her original lifetime. While it is known that calling binds an individual's soul to a Primal, this connection is lost at reincarnation - but the connection to the unknown Primal to which she was bonded may not have been lost, and thus it is possible that there exists in every generation an individual capable of calling upon this Primal, if they choose to pursue the path of the caller. This page was last modified on 30 June 2017, at 15:22.